The Chorale, the premier choral ensemble at the College, represents TCNJ at events on and off campus and has toured throughout the United States, eastern Canada and England. This auditioned ensemble, composed of undergraduate students from both music and other majors across the campus, was praised in 2012 by Harry Rolnick of ConcertoNet.com as “excellent” with “superlative voices,” and “entirely in control” by Michael Miller of New York Arts. 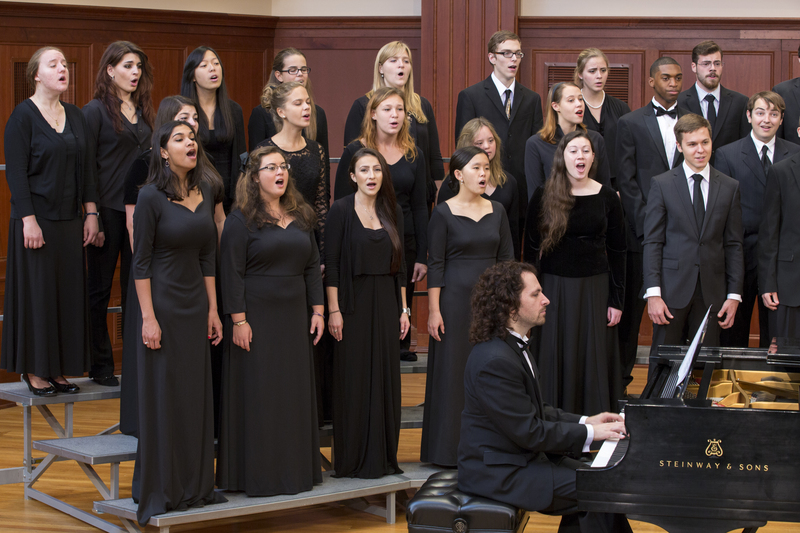 In addition to its regular concerts on campus and in New Jersey, the Chorale has performed twice on the Great Music at St. Bart’s concert series at St. Bartholomew’s, New York, and multiple times at Lincoln Center. In 2012, the Chorale commissioned its first work, Poet of the Body and The Soul by Andrea Clearfield for mixed chorus and piano. It has recorded new works by New Jersey composer Robert S. Cohen that can be found on Santa Barbara Press, and has also performed with The Philadelphia Orchestra, Magnificat, Argento Ensemble, the Philharmonia Orchestra of New York (formerly the New York City Opera Orchestra), and Peter Schickele (PDQ Bach). The course is designed for the musically advanced choral student. The ensemble rehearses and performs a variety of unaccompanied, sacred and secular vocal chamber literature. Open to all students through successful audition by the director.